This upcoming suite of products allows our partners to license reliable technology from a company they trust to be their long-term strategic technology partner. Over the next four weeks, Tech Soft 3D will introduce a suite of products to help engineering software developers build cloud and mobile compatibility into their applications. Focused on leading the charge into new environments for engineering applications, this new set of tools will enable developers to deliver robust, graphic-enriched software on a faster timetable than ever before. Developers currently have to code mobile or web applications from the ground up. Tech Soft 3D’s upcoming toolkits allow developers to start one step ahead, and focus their attention on core competencies rather than supporting high-performance graphics on different platforms. HOOPS Visualize: The industry’s most widely used visualization toolkit becomes even more robust in an update that focuses on the high-performance handling of large models and assemblies. HOOPS Visualize for Mobile: This new product allows engineering software developers to develop mobile applications that work across all iOS and Android devices. HOOPS Communicator: Radically updated, this true plug-in technology enables advanced 3D visualization and model inspection in web and mobile applications for developers without any 3D expertise. HOOPS Exchange: This upcoming release of HOOPS Exchange will be available for licensing in cloud/server environments, putting proven CAD data access tools in the hands of next-generation application developers for a customized final product. HOOPS Publish: A new version of HOOPS Publish will be available for licensing in cloud/server environments to enable a variety of 3D data workflows, allowing for production of unique software that is untethered from the desktop. 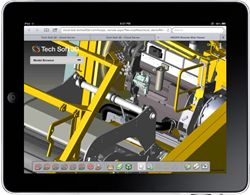 Developers have used Tech Soft 3D’s advanced tools for over a decade to extend engineering solutions and products, ranging from venerable CAD solutions such as PTC’s CADDS5, to more recent applications from companies like Autodesk, SolidWorks and Trimble. Tech Soft 3D’s experienced software development team understands what developers want and need today (and tomorrow) in their mobile and web environments. These products will be launching individually throughout October. Customers will be able to purchase them individually or as part of a package. For more information, please contact (541) 383-4126.